The road from Pithoragarh to Munsiyari remained closed for the second day today as fresh snowfall covered the 15-km-long stretch of the road between Giniband to Munsiyari. 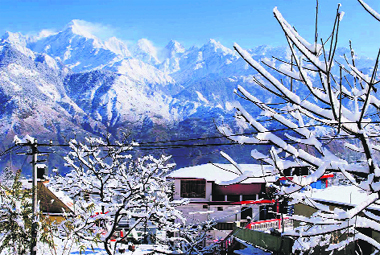 A view of Munisiyari town of Pithoragarh district after snowfall. BJP candidate from Mussoorie Ganesh Joshi formally inaugurated his election office at Minerva Hotel today. Before opening the office, a havan was performed in which large number of BJP supporters participated with enthusiasm. Snowfall is likely to take place in the higher reaches of Uttarakhand in the next 24 hours, whereas rain will continue in mid hills and other parts of the state. Dehradun, January 8 Under the aegis of the Uttarakhand State Biotechnology Department, Graphic Era University commenced two-week-long special training on microbiology on the university campus here today. Young and vibrant participants from all walks of life ran in the Special Olympics “Law Enforcement Torch Run” held under the aegis of the Ministry of Sports and Youth Affairs, Government of India, and the National Federation for the Development of Sports for People with Intellectual Disabilities in Dehradun, here today. 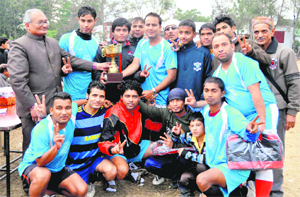 Doon Star got past Garhwal Sporting 5-4 in a tiebreaker in the final of the Ram Bahadur Chhetri Football Tournament here today. Manish of Doon Star netted the first goal (12th) while Madan Uniyal of Garhwal Sporting scored a goal for the team in the 68th minute. THE poll season is here and it so happens that it has the ability to make people forget the winter chill in the excitement that accompanies the entire electoral process. However, the tempo with regard to the hectic electioneering is yet to pick up. People for Animals (PFA), Dehradun, has urged the citizens of Dehradun to come forward to adopt stray dogs. PFA volunteers, led by Manavi Bhatt, today reached the Gandhi Park and informed the people about the ‘Adopt a homeless dog, bring home a friend’ campaign of the PFA started in the country last year. The roads in Majra have been dug up to lay sewerage lines and most of them have been covered up, without carpeting. The roads have become muddy due to last two days’ downpour. Majra residents are not complaining because this is how they have lived for almost a decade when the water overflows from the small drains built on the right and left sides of the roads and spreads out on the roads. Now they just want this nightmare to come to an end. Kalamuni and Munsiyari due to which the transportation from Thal to Munsiyari remained suspended. Due to lack of snow cutter with the department, if the snowfall continues, the road could be opened only after the weather clears and labourers could be deployed on the work. “Due to the blockage of this road at Kalamuni and lack of snow cutter with the department, the tourist flow to see snow in Munsiyari is being disappointed, resulting the losses of businessmen of this snow city which mostly depends on the tourist revenue,” said Puran Chandra Pandey, a hotel owner in Munsiyari. According to the sub-divisional administration of Munsiyari, the people, who want to visit the district headquarters, are now diverting towards Madkot and Jauljibi to find the vehicle for the district headquarters. “The people of the town are compelled to go 20-km extra on local vehicles to reach to the main road as the local road up to Jauljibi is much risky because at some places, it depends on the wood bridges,” said Pandey. BJP candidate from Mussoorie Ganesh Joshi formally inaugurated his election office at Minerva Hotel today. Before opening the office, a havan was performed in which large number of BJP supporters participated with enthusiasm. Sweets and ladoos were distributed on the occasion by the BJP workers at the office here. Elated, Ganesh Joshi reiterated his claims that BJP will wrest the Mussoorie seat from the Congress this time round as the tide was against sitting MLA from Congress Jot Singh Gunsola. Ganesh Joshi further said that the Queen of Hills was ailing with basic problem of parking since the last 10 years and this has affected hotel business adversely, and it would be his priority to assist in constructing a grand parking for the tourists to avoid any traffic congestion in the town. He also said that the town was facing an acute housing crisis due to the Supreme Court ban in the town, and it would be his endeavour to constitute a new housing policy for the poor sections of society so that they are able live with dignity. When questioned by the media despite being in power, why did the BJP government fail to address the problems of Mussoorie, Joshi responded by saying that the onus clearly fell on the local MLA Jot Singh Gunsola as he had failed to take any initiative in during his tenure. Joshi assured that BJP will once again form the government in the state. Mussoorie Municipal Council president OP Uniyal, who is also facing a CBI enquiry on the charges of corruption under the directions of the High Court, was also present during the inaugural function of the BJP candidate at Ganesh Joshi’s election office. Both exchanged sweets on the occasion. constituted against him on the direction of Supreme Court, he had to step back, leaving no option but to support Ganesh Joshi. Meanwhile, Jot Singh Gunsola, the sitting MLA from Congress, is also preparing for his nominations and efforts were on to avoid dissent in the Congress by bringing Godavari Thapli ,the probable candidate who has been opposing the candidature of Jot Singh Gunsola. Meanwhile, the Election Commission is keeping a close watch on the expense being incurred on the election office by the political parties. When contacted, the district election officials said that they would be making a video of every office and monitor the expense being incurred on it closely, and if any anomalies are found, strict action will be initiated. 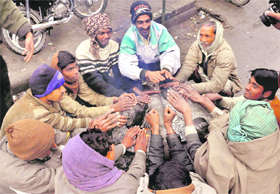 According to Dehradun, Meteorological Department’s Executive Director Anand Sharma said cold wave conditions would continue in Uttarakhand with snowfall taking place in higher reaches and rain in other parts of the state. Meanwhile, the Uttarkashi district administration has expressed concern over regular snowfall in higher reaches of Uttarakashi district. District Magistrate Uttarkashi Akshat Gupta informed that he had received a list of 24 polling booths in Uttarkashi that were snowbound. He said all necessary preparations were being done to ensure that the snowfall did not disrupt polling in these booths. Under the aegis of the Uttarakhand State Biotechnology Department, Graphic Era University commenced two-week-long special training on microbiology on the university campus here today. A large number of students as well as teachers from far-off places of Uttarakhand gathered to participate in the training camp. The director of the Uttarakhand State Biotechnology Department, Dr Jagmohan Singh Rana, flagged off the training programme with an aim to providing technical support to the students as well as the professionals of microbiology in the state. Lieutenant General Manvendra Singh, IMA, flagged off the run starting from Gandhi Park and to the SSP’s residence. A large number of people from defence, civil, schools and colleges along with the disabled participated in the event. The run was conducted with an aim to encouraging people towards teamwork and to create awareness about human rights among all. The run was a practising event for children with special abilities who would participate in the Special Olympic Games to be held at South Korea in 2013. The federation is also conducting a week-long National Athletics Training Camp for the North and the Central India starting from January 7 to 13 to promote sports among students from different parts of the country. The match drew with the score of 1-1 in the stipulated time. This took the match to a tiebreaker. The Doon Star team won 5-4 in the end of this round. Manish, Pankaj, RS Rawat and Shivender scored for the winning team while Naveen, Vikram and Sumit Chhetri scored for Garhwal Sporting. However, old timers say that the flavour of the elections is neither visible now, nor will it be felt in the future. The reason is that the Election Commission of India (ECI) has been getting stricter with every poll that it has been conducting in the country. With the primary focus of the ECI being on curbing the poll expenses, there is very little colour to be expected in the poll campaign as every pamphlet and poster would have to be accounted for, and the candidates have been told to adhere to the norm of not exceeding their poll expenses beyond Rs 11 lakh. The model code of conduct is being strictly implemented as right from the word go, notices have been issued on every violation, whether it is big, small or minute. Republic Day celebrations coming in between. In addition to this, just when the electioneering is expected to peak, the marriage season is also expected to commence. Hence, a large number of the people would be tied down in the marriage celebrations around the time polling is to be held. Even during these days, the people in whose families marriages are scheduled to take place are busy preparing for the occasion, while willingly or unwillingly having to give a go by to the election-related activity. Ensuring a high voter turnout would be a challenge for the election machinery as January 30 is expected to witness a very large number of marriages. The web has surely turned out to be an effective medium to put across one’s views during the poll season. A very interesting mail that is doing the rounds and is being sent across to bulk receivers pertains to the use of titles by some of the politicians. Besides being the New Year’s Eve, December 31, 2011, held a special place in the hearts of the residents of Kumaon. It was on that day that the last train on the metre gauge route to Lucknow - the Nainital Express was flagged off from the Lal Kuan station. The service would now be resumed only after the gauge is converted into a broad gauge. Reports say that for the last 126 years in the history of the region, the metre gauge service had taken the people of Kumaon to the city of nawabs. The Nainital Express had witnessed several changes that came with the technological advancements of the Indian Railways. It graduated from a train driven by a steam locomotive to a diesel one. It was on April 23, 1884, that the train service to Awadh had been started under the name of Awadh Tiruvar Mail. On the evening of December 31, a large number of people from Lal Kuan, Haldwani, Pantnagar and even Rudrapur had come to witness the metre gauge train undertake its last journey from the Lal Kuan station. The train had been decked up for the occasion. While the people felt nostalgic about its last journey, they were also optimistic of better services that would be in the offing once the gauge is converted. The Railways have announced in the recent past that they want to develop the Lal Kuan junction as the gateway to Kumaon. The volunteers said they were making all efforts to find homes for the stray dogs of Dehradun. Manavi Bhatt said the volunteers of the PFA would be available outside the Gandhi Park gate every Sunday from 3-5 pm to urge the people of Dehradun to adopt these stray dogs. An unmetalled road in Ward No. 46, Dehradun. Asian Development Bank (ADB) agency has started the project of sewerage lines and laid down 60 per cent of the lines by now. Bano Begum complained of the irregularity in disposal of garbage from the big dustbins kept at prominent locations of the area. She said: “The garbage scatter around once the dustbins get filled up to the brim. It attracts stray animals. 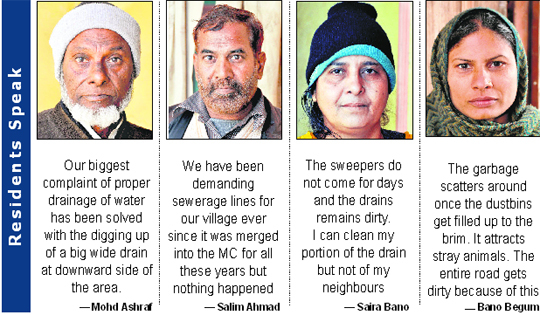 The entire road gets dirty because of this.” The councillor said the number of sanitary workers in his area had drastically reduced to half, which was causing a lot of sanitation-related problems. He said he had written to the Mayor in this regard.